Here at Turning Veganese, Brent, Melissa and I can agree that cheese is the hardest habit to kick when transitioning from a carnist to vegan lifestyle. We’ve made 3 previous posts about cheeses we’ve tried and whether or not we liked them, were useful, thought the ingredients and nutritional profile were an improvement and if we thought they were a good value. We’ve managed to track down a few more vegan cheeses and wanted to share them with you. Better than Ricotta by Tofutti was stunningly similar to ricotta. The ingredients include soy but it’s free of nuts, dairy and gluten so it’s suitable for people with those sensitivities. It’s pretty high in calories, equal to that of regular cheeses so I’ll probably stick with home-made tofu ricotta which is also considerably cheaper compared to the $5.49 or about 30 cents per ounce. 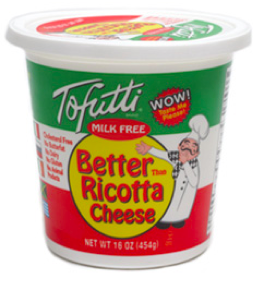 Better than Sour Cream, also by Tofutti is another product that we liked the flavor but found the nutrition lacking and the ingredients highly processed. 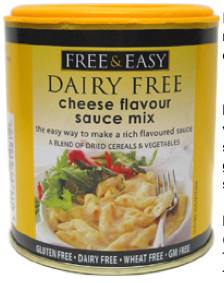 It also contains soy but is free of nuts and gluten making it suitable for some common food allergies but not others. Making you own at home is probably more budget friendly but this makes a great taco topping in a pinch. Making your own will be a better bet in terms of nutrition and price. It’s priced at $3.49 for 12 ounces. 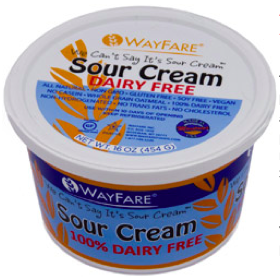 We Can’t Say it’s Sour Cream by Wayfare Foods had a great calorie profile at 35 calories per ounce and is free from soy, gluten or nuts (except for coconut). The taste and texture were a little confusing. 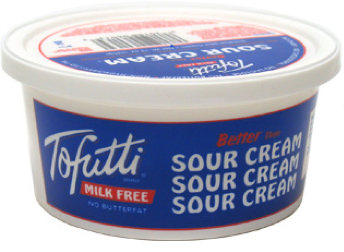 It tasted kind of like sour cream but more like Tofutti’s Better than Cream cheese. The texture was also more like cream cheese than sour cream, even after we mixed the top layer of liquid into the bulk of the product. It cost us $3.99 for 16 ounces making it a better value than Tofutti but I suspect that a lot of people wouldn’t be convinced by the flavor and texture to really enjoy it. Free & Easy Cheese Sauce mix is more of a flavoring than a cheese substitute but can help make things that are supposed to be cheesy taste like something approaching white cheddar. The ingredients are pretty processed but mostly inoffensive and are suitable for someone with nut, soy or wheat allergies. The container says there are 12 servings in the can but I don’t think you need as much as they say to get the flavor they’re advertising. You can add this to sauces, nut or lentil pate, soy-curl “chicken” salad and anything else that you’d want to have a cheesy kick. With this product, a little goes a long way so it’s a pretty good deal at $6.95 for a 130 gram container. Nacheez This particular cheese was low in calories (20 per ounce) and the ingredients were relatively unprocessed and inoffensive, though it does contain nuts. It’s a great source of B vitamins, iron and Vitamin C. The flavor is pretty good, though we had to add cayenne to make the ‘spicy’ version spicy enough for our taste. It microwaved well in its glass container turning into a molten pot of awesomesauce that’s great for dip at a party or pouring over your favorite taco recipe. It was a little pricey at $6.99 or 82 cents per ounce. 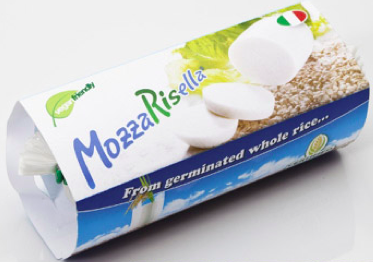 Mozzarisella is something I’ve been excited about because I’ve been seeing rave reviews. It comes packaged like Teese and has a softer texture. The ingredients are not particularly objectionable but the cheese has no particular nutritional value. When we actually got to tasting it, I found it had an oddly chemical flavor and Brent’s remark was that it was “like sucking on a garden hose”. We might have gotten a bad batch but I don’t think I’ll be buying it again. Even at a sale price of $7.95 ($2 less than retail) it wasn’t worth it for 7 ounces. 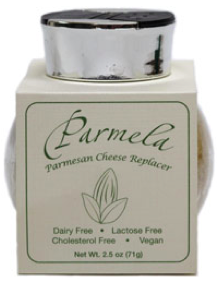 Parmela has a standout list of ingredients and a nutritional profile and flavor to match. I think the packaging is a great addition because it’ll look nice on your table at a fancy party when you’re serving pasta but I think it’s a little pricey at $3.99 or $1.60 per ounce. I’ll probably stick to Parma by Eat in the Raw. Parma also contains nuts so neither is suitable for those with nut allergies. 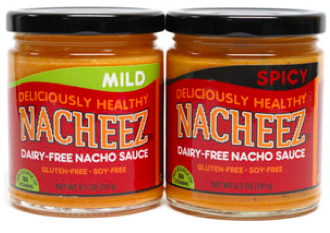 Vegan Queso by Food for Lovers does not contain nuts like Nacheez but does contain gluten so this is suitable for people with nut allergies but not for those who are sensitive to gluten. It’s very close in flavor, ingredients and nutrition to Nacheez and is similarly great for use as a dip or a topping for enchiladas or your favorite TexMex cuisine. A little cayenne and a microwave is all it needs! It’s sold at $5.99 or 50 cents per ounce which is a better deal as long as you’re not sensitive to gluten. So we’ve shown you some more of the cheeses we’ve managed to get our hands on and hope you’ll get to try and decide for yourself. Also let us know your favorites and if we haven’t tried them, we’ll give it a spin. your research is impressive. i too went through all sorts of substitutes early on. i think finding the right ones is key in transitioning. as far as sour creams go, i think follow your heart makes the best one, and i also prefer their plain cream cheese. if you get the herb or chive varieties, galaxy foods and tofutti are good too. I really liked the flavor of Follow your Heart cream cheese too but I’m watching my figure so Tofutti’s calorie count won. I gotta try Follow Your Heart’s sour cream the next time we have taco night. Thanks for the tip! Isn’t that weird? I find that happens a lot for me too. I prefer home made just about all the time. Great round-up. There are a few items I haven’t heard of that I will keep an eye out for. 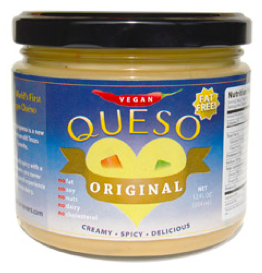 I dig the vegan queso; used it on some nachos a few weeks back and the omni boyfriend really liked it. I thought it had a respectable kick of spice. Thank-you! We do enjoy throwing ourselves on the vegan-cheese grenade for the benefit of others… let me know if you find one we haven’t reviewed. It seems like companies are constantly trying to fill the niche.